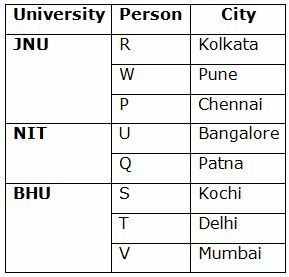 Eight persons P, Q, R, S, T, U, V and W are studying in three different universities viz., JNU, NIT and BHU. They all are belongs to different cities viz., Delhi, Bangalore, Kolkata, Mumbai, Chennai, Pune, Patna and Kochi but not necessary in the same order. Not more than three persons studying in the same university. P belongs to neither Patna nor Delhi. S does not belong to Kolkata. V does not belong to Delhi but studying with the one who belongs to Kochi. 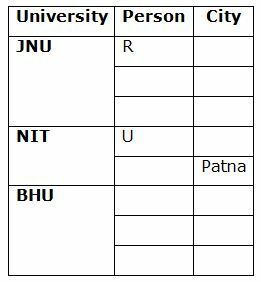 U is studying only with the one who belongs to Patna but not in BHU. R does not belong to Patna. S is studying with the one who belongs to Delhi in BHU. W belongs to Pune. W does not study in the same university as the one who belongs to Delhi. P is studying in the same university as the one who belongs to Kolkata. Q and the one who belongs to Bangalore are studying in the same university but not in BHU. The one who belongs to Mumbai does not study in JNU. R neither study in NIT nor in BHU. 1. 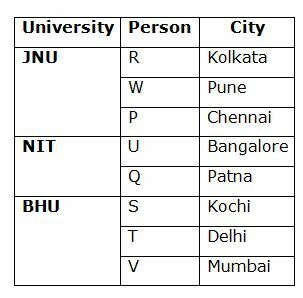 P belongs to which of the following cities? R neither study in NIT nor in BHU. U is studying only with the one who belongs to Patna but not in BHU. R does not belong to Patna. S is studying with the one who belongs to Delhi in BHU. W belongs to Pune. W does not study in the same university as the one who belongs to Delhi. P is studying in the same university as the one who belongs to Kolkata. P belongs to neither Patna nor Delhi. S does not belong to Kolkata. Q and the one who belongs to Bangalore are studying in the same university but not in BHU. V does not belong to Delhi but studying with the one who belongs to Kochi. The one who belongs to Mumbai does not study in JNU. 3. 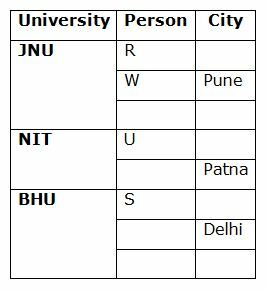 Which of the following group belongs to BHU? 4. Who among the following persons belongs to Delhi? 5. U is studying in which of the following universities? Eight persons J, K, L, M, N, P, R and S are belongs to the same family with three different generations. 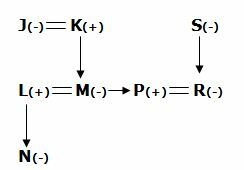 K is the father of M. N is the daughter of L, who is the husband of M. R is the daughter-in-law of K, who has only two children. J is the maternal grandmother of N. S is the mother-in-law of P.
6. How is P related to J? 7. If W is married to N, then how is W related to M? Point T is 5m to the east of point F and 3m to the north of point B. Point M is 4m to the west of point B. Point K is 6m to the north of point M and 6m to the west of point N. Point X is exactly midway between point K and M.
9. What is distance between point X and B? 10. What is the direction of point N with respect to point M? 1) P belongs to which of the following cities? 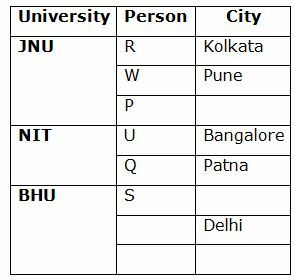 3) Which of the following group belongs to BHU? 4) Who among the following persons belongs to Delhi? 5) U is studying in which of the following universities? 6) How is P related to J? 7) If W is married to N, then how is W related to M? 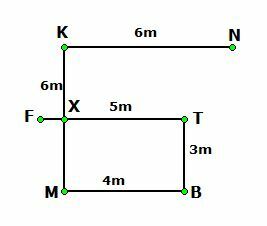 9) What is distance between point X and B? 10) What is the direction of point N with respect to point M?